With Mother’s Day just around the corner (Sunday May 11), we have rounded up a few gift ideas for Mom. The items are sweet and unique and will make great gifts for the baker or non-baker. To make it easier for you we have divided it into 3 different categories; $50 & under, $25 & under and $10 & under. Also keep in mind while shopping for Mom that starting today we will be running a Mother’s Day promo! FREE gift with purchase of $35 or more. Use promo code: MOM14. 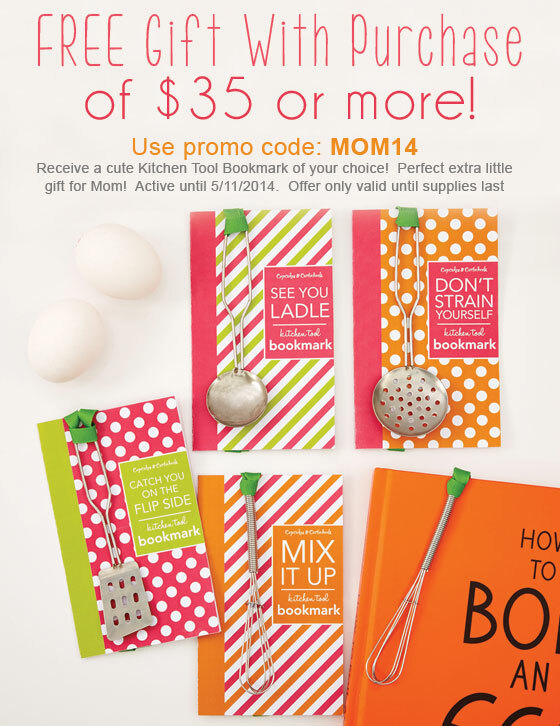 Receive a cute Kitchen Tool Bookmark of your choice! Active until 5/11/2014. Offer only valid until supplies last. 1. Honeycomb Pull-Apart Cake Pan – $45.00 – Make a honeycomb-shaped cake with pull-apart sections for easy sharing – perfect for any occasion! We also have a yummy Lemon Cake Pull-Apart Recipe to go with it! 2. Heritage Bundt Cake Pan – $38.00 – One of the most stunning bundt pans we have ever seen! This Nordicware Heritage Pan features a lovely spiral design with dramatic, deep ridges. It makes a wonderful addition to any bakers kitchen. Be sure to check out our favorite Old-Fashioned Pound Cake Recipe for this pan here. 3. My Family Cookbook – $35 – This very special cookbook is blank for your family’s recipes. Archive generations of kitchen secrets and keep your favorite recipes in the family. 4. Sugar Glass Bowl & Spoon Set – $30.00 – Sugar bowl has a pewter finish lid and comes with a coordinating spoon impishly stamped “Gimme Sugar”. 5. Gourmet Japanese Tea Sugars – $28 – Package features 25 handcrafted sugar squares decorated in a colorful bouquet of fresh pink, yellow and purple blooms. Treat your Mom to savor the sweetness that lifes little pleasures can bring. 1. Cooking With Flowers Book – $24.95 – Cooking with Flowers is filled with special confections and easy everyday treats that everyone will love, from jewel-toned Violet Jam and pretty pink Lavender Lemonade to Pansy Petal Pancakes and Carrot Sunflower Cake. 2. French Label Soap with Glass Tray – $20.00 – Beautiful Essence de Fleurs scented soap bar comes with matching glass tray to add a touch of luxury to any boudoir. Makes a very special gift! 3. Double Cocao Chili JamDoily Cake Mix – $17.00 – Kit contains dry ingredients for two 9″ cakes, one paper doily & powdered sugar for decorating. Simply add your own eggs, vegetable oil, milk & your favorite jam. Makes a very fun and unique gift! 4. Lovely Mother Spatula Set – $16.00 – These delightful Mother’s Day spatulas come printed with floral motifs and a cute little slogan. 5. Letter Basket Sewing Kit – $15.00 – The kit has all your sewing essentials including a Measuring Tape, Needles, Scissors, Thread, Seam Ripper, Thimble, and Pin Cushion. 1. Tea With The Queen Cookie Cutter – $10 – Afternoon Tea is a great British tradition, and what could be better than “tea with the Queen”. Bake posh cookies with the silhouette of Her Majesty. We think this is a fun Mother’s Day idea! 2. Garden-in-a-Bag Pansies – $10.00 – This unique container garden is a wonderful gift for someone special. Includes: seed, growing medium, coconut husks for drainage and directions. 3. Mother’s Day Vintage Stamps Wafer Paper – $10.00 – Create a Mother’s Day gift that will be remembered for years to come with this lovely collection of edible vintage floral stamps. 4. Lovely Mother Tea Towel – $9.50 – A Mother’s Day tea towel with bright floral patterns and “Oh what a Lovely Mother You Are” printed on it. 5. Cameo Silhouette Cookie Cutter – $9.00 – This unusual cutter creates a cameo silhouette cookie perfect for Mom! The cutter is detailed, creating perfect embossed lines in your finished cookie.